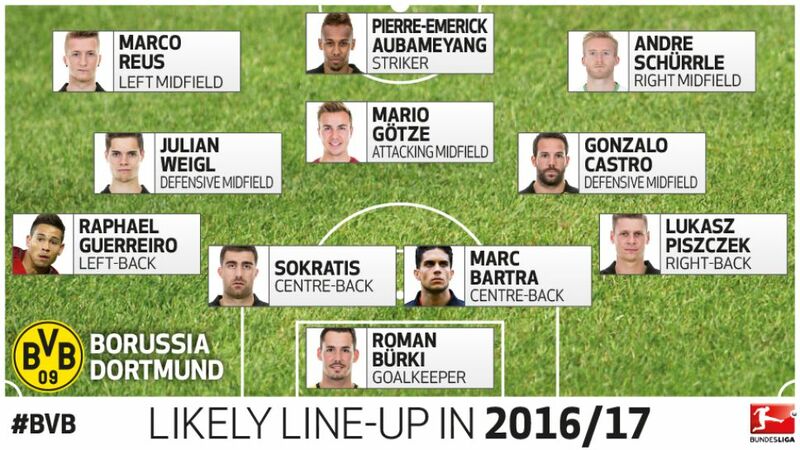 How might Borussia Dortmund line up in 2016/17? Borussia Dortmund have sold carefully and bought wisely this summer, but how will coach Thomas Tuchel fit in all the new pieces of his Black-and-Yellow jigsaw? bundesliga.com takes a look. Think you have what it takes to predict Dortmund's results this season? Then prove it by playing the official Bundesliga Predictor! Tuchel impressed in his first season at Borussia Dortmund, steering Die Schwarz-Gelben to second place with a points haul that would have delivered the league title in all but four previous Bundesliga seasons to date. However, there was a feeling he did so with a squad built by predecessor Jürgen Klopp. With the revolving transfer door spinning as fast as ever at the SIGNAL IDUNA PARK this summer, how might BVB line up in 2016/17? If Tuchel subscribes to the old adage of not fixing something unless it is broken, then it is fairly safe to assume that he will maintain the 4-2-3-1 formation he used for nearly the whole of last season, and the club has signed players accordingly. Götze scored 22 goals and assisted 24 in his previous three full seasons in the BVB first team, and is likely to produce similar numbers from attacking midfield, whilst Bartra is a ball-playing centre-back who tries to build play from the back much as Hummels does. BVB fans worrying how they might replace Mkhitaryan's 11 goals and 15 assists from out wide will be soothed by the sight of Schürrle and Dembele. After a slow start, Schürrle plundered nine goals from just 14 Rückrunde starts last term. The 19-year-old Dembele, meanwhile, scored 12 and assisted five as Stade Rennais FC finished narrowly outside of the European places in France, and he took only three minutes to open his BVB account, scoring in the recent 5-2 win over fifth-tier SpVgg Erkenschwick.